It's not just the financial and economic world that's being turned upside down with fast changing events in motion that will impact for many years. Last week saw that maybe energy does not equal mass X the speed of light squared. Eeeek ! There goes Einstein's theory of general relativity and the past 100 years of physics (if true) over the event horizon and into a black hole, though the theory has always had something major missing which is why there existed the fundamental disparity between quantum mechanics and general relativity that maybe we will get much closer towards understanding if E=MC2 is busted. Similarly the Euro-zone has reached the edge of its own event horizon of disappearing into a financial and economic black hole the response to which is likely to be rampant Euro-zone money printing to monetize PIIGS debts takes place following the orderly bankruptcy of Greece due to the impossibility of an economically contracting country being able to service an ever expanding debt mountain, a vicious cycle of ever higher debt to GDP triggering ever greater economic austerity, resulting in an even higher debt to GDP ratio as the economy contracts and the tax take falls. Greece debt holders to take a 50% hair-cut i.e. cut Greece debt from Euro 340billion to Euro 170billion. Cut the interest rate PAID on Greece debt, perhaps to even ZERO. Expand the financial stability fund from 440 billion euros to at least Euro 2 trillion and perhaps even Euro 3 trillion by leveraging up by ECB money printing. Re-capitalise the bankrupt European banks that would take a huge hit on a Greece default. There are no ifs, or buts, Greece IS bankrupt, this is nothing new but something I have repeatedly been iterating for the past 2 years. A Greece debt default is now imminent because it CANNOT PRINT MONEY! It cannot PRINT EURO's therefore it cannot do what Britain, and the United States are doing which is to STEALTH DEFAULT by means of HIGH REAL INFLATION. You know it when you go to the super market to do your weekly shop and see that your money can barely buy 85% of what it could a year ago. 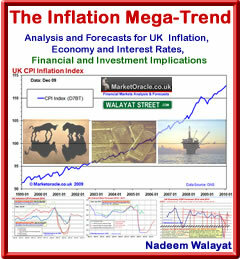 There is HIGH REAL INFLATION in the UK right now! Far beyond the official CPI of 4.5% or RPI of 5% which in themselves are HIGH, well above government target of 2%. Yes, I know you still hear the highly vocal the deflation fools, crying DEBT DELEVERAGING DEFLATION, which has shown itself to be a RED HERRING as there has been NO DEFLATION as I warned of now near 2 years ago (18 Nov 2009 - Deflationists Are WRONG, Prepare for the INFLATION Mega-Trend) , and January 2010 Inflation Mega-trend ebook (FREE DOWNLOAD). The fact of the matter is that even bankrupting Greece that has seen its economy CONTRACT for 2 straight years under the weight of economic austerity without end but yet has has had INFLATION during the whole period, for instance the current INFLATION RATE for Greece is CPI 1.67%. As you can see if there is inflation where there 'should' be deflation then what is that telling you about the real state of the global economy? So how do deflationistas respond to there having been NO DEFLATION during the past 2 years ? "In my model, falling prices are not a requirement for deflation." This is what happens when analysts become detached from the real world. My long standing view has been that once money printing starts it cannot stop whilst large budget deficits exist, and large budget deficits will continue to exist until economies start to grow in real terms at trend, which means that the eurozone is now about to begin playing catch up by rampant money printing both overt (QE) and covert (off balance sheet) that is taking place elsewhere in the world, notably the UK, USA and Japan. For the UK we only need to look at the inflation indices to see proof of rampant money printing at work as all governments have only one solution which is to stealth default by means of high real inflation which stands several points above official indices of CPI and the UK more recognised RPI i.e. rather than at 5%, real inflation as most people actually experience is nearer to 7%. The Eurozone looks set to leverage the current 440billion financial stability fund to as high as Euro 3 trillion through means of smoke and mirrors borrowings to hide the truth from the general populations as to the inflationary consequences of what is a policy of stealth debt default means of high real inflation as it prepares to finance PIIGS debt write offs. 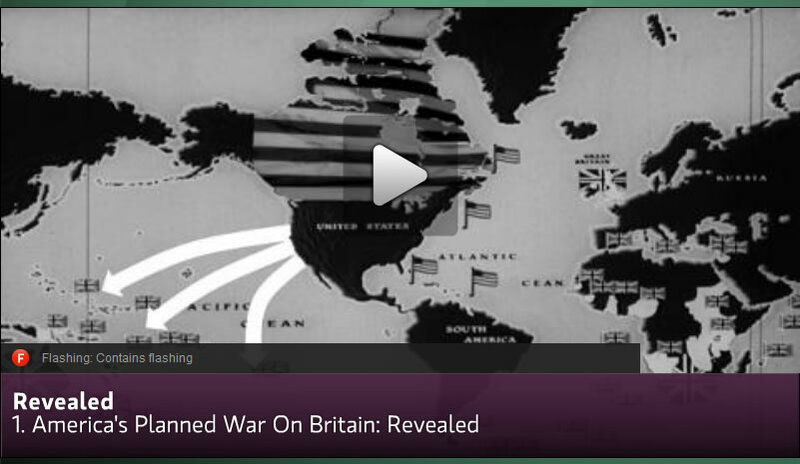 Top secret documents reveal America's 1930's plan of war against the Red Empire, but America's foe in this war was not the Soviet Union or Japan, it was not even Nazi Germany, plan red was code for an apocalyptic war with Britain and all its dominions. The plan emerged from the Great Depression amidst the rise of evil regimes at a time when even some in America had been seduced by dark forces. In the 200 years since the American Revolution, the United States and Great Britain have moved from enemies to firm allies. This documentary follows military experts and historians as they work through the top secret 'War Plan Red' to see how a hypothetical battle between America and Great Britain might have unfolded. Wars follow economic depressions, and the enemy may not be who you think it will be. Whilst we can discount a war between America and Britain today, after all the red empire now only exists in the history books. There remain several candidates beyond the usual suspects. To the North is Canada (for which the US has been actively planning to invade for close on 200 years), to the South is Mexico (there have been several wars of conquest already), To the West is China and to the East is Africa (the past decade has seen much action). I think we can discount Europe and Russia, ..... for now as likely the forces of these military blocks could be utilised in an 'Allied' attack on China as one empire rises and another empire declines. Now what usually happens the politicians coupled with the intelligence agencies who's primary function is to spread misinformation and propaganda via the mainstream media will seek to demonise and dehumanise the Chinese into a new evil empire, to build up a fever of nationalism in the general population so that they will be eager to lay down their lives on mostly the basis of lies just as countless have fallen for the Iraq threat propaganda and many of whom still continue to believe the lie that somehow Iraq was behind Sept 11th stockpiled with invisible WMD's that were an imminent threat to America and the West. Economic Depressions are dangerous because they provide easy fuel for the politicians to inflame nationalism with the ultimate conclusion is to mobilise the millions of unemployed towards war on a scale that would make Iraq and Afghanistan look like a picnic. Therefore those that rightly criticise the bailouts of banks and even whole countries and the inflationary stimulus spending (including yours truly) need to contemplate the broader picture beyond monetary considerations in that these fiat paper printing actions are mere tips of an ice-berg of what could follow if trends were allowed to proceed towards their logical conclusions, because just as all countries are trending towards debt default bankruptcy and an hyperinflationary panic event (loss of confidence in fiat currency), all countries are also trending towards their own destruction as we repeatedly see but yet fail to acknowledge i.e. Iraq destroyed, Afghanistan destroyed, Libya, Egypt, Syria, pending....? The continuing trend of economic stagnation is stoking the fires of paranoid nationalism that will ultimately result in the need to create enemies to be dealt with for which the prime candidate at this point in time is the emerging China superpower, though when paranoid nationalism lets rip anything is possible, anyone can become 'the enemy'. The War on Terror and the stripping away of many civil liberties and freedoms so that anyone that does not agree with the military machine must therefore be a traitor, which has created the backdrop for the next phase for the militirisation of America as the only growth industry appears to be the military industrial complex which requires expanding budget deficits and an never ending stream of new enemies to justify its expansion. Watch out for The Patriot Act II, then III, then The Traitor Act I. At the end of the day the enemy will morph to become the general population. Will Greece Leave the Eurozone ? On face value Greece appears on the fast track towards economic collapse and war with its neighbours (Macedonia ? Turkey? Albania? ), so I can well understand why the Euro-zone will try its hardest to not let it leave because they understand that it would open Pandora's box that has kept ancient hatreds in check and thus so far succeeded in preventing a Europe wide war for over 60 years, which is the primary purpose for the creation of the European Union, to anchor Germany down to such an extent so as to prevent Germany from starting its third World War which would result in the annihilation of Europe and much of the rest of the world. If Greece does leave the euro-zone we may well look back on such an event as the spark that ignited World War III, which means that despite the severity of the current crisis Greece probably won't leave the Euro-zone even when it does go bankrupt as the 50% hair-cut implies. So Greece WILL default on its debts AND REMAIN in the Euro-zone. How Could Greece Go Bankrupt and remain in the Eurozone ? The problem with Greece is that it's Government and population have become lazy by spending well beyond their means (not helped by their gambling banks). The first thing Greece needs to do is to cut its budget deficit, it needs to wipeout the welfare state that it could never afford, this is the purpose of the austerity measures, to reduce the burden of the public sector that is acting like a noose around the Greek state, the debt is not the problem, the debt is the stick to beat the Greece economy into a competitive state so that it can grow, because the debt will be defaulted away, but this will only work if the economy becomes competitive. Secondly the debt interest burden needs to be slashed, this is what debt default and fixed low ECB bailout interest rates will succeed in delivering, i.e. the ECB will likely continue to subsidise Greece interest rates on new debt at well below the market rate for many more years. As long as interest payments continue to be rolled over into new debt, then this will ensure that interest payments are spent within the Greek economy rather than sucked out of the economy, these twin forces should eventually result in igniting economic growth as it will leave Greece with a lower debt interest burden and a more competitive economy. However it may take a several more years of several more hundreds of Euro-zone billions pissed down the Greek drain to get to that stage, given the current lack of competitiveness of the Greek economy as a consequence of the inability to devalue wages via exchange rate adjustments. Thirdly, Greek and other exposed european banks would have to be fully recapitalised by the ECB (nationalised) to ensure that they do not go bankrupt during a Greek debt default and similarly repeat the process with other PIIGS banking sectors. The effect of preventing the eurozone's worst run country from leaving the Euro-zone will hugely strengthen the Euro (a major buy signal!) as it would imply other potential bankrupting PIIGS would also similarly have their debt written down without triggering a collapse of the Euro-zone currency block. This could mark the first of a series of periodic debt write offs that could take place every few years in response to the recycling of budget deficits into debt rather than debt interest leaving the PIIGS as wealth from Core Europe is transferred to Peripheral Europe until a system of transfer payments is formalised in the form of the permanent financing of a large part of Peripheral State deficits to the point where economies are able to compete across the Euro-zone in terms which generally means significantly lower wages for peripheral european workers. The Decline of the West and Rise of China? Many argue that debt crisis is a symptom of the west being in terminal decline to be soon replaced by the likes of China or that a clash of civilisations is taking place between the West and Islam. However these are flawed arguments that ignore the reality that the East has not been able to compete against the West for over 400 years due to myriad of fundamental reasons that go far beyond debt and deficits which encompass systems as a whole that include innovation, relatively free political systems and free market competition. If the European Union is today seen as being a fundamentally flawed entity, it then still is far more robust than the system that operates in China which is at far greater risk of imploding than the EU or the US. In fact rather than witnessing the rise of the East we may soon be witnessing the Peak of the East. The answer as to why is staring us literally in the face, in that China, and large swathes of the Islamic world are WESTERNSING, i.e. their system CANNOT compete against the WEST but instead are being forced to CONVERT to the WESTERN MODEL in virtually every aspect, and it has to be EVERY aspect, because any element that does not replicate the Western Model will leave such nations at a comparative DISADVANATGE and if it cannot compete then ultimately as GDP per capita converges will stagnate ultimately resulting in economic collapse. In recent months we have been witnessing the Islamic world in revolt, they want freedom of expression, freedom of thought, economic freedom from corruption, they want free elections, they want to WESTERNISE. The masses don't want Islamic Sharia Law, they want a WESTERN model of laws for which they are literally willing to die for by the thousands as we have see in Libya and are seeing in Syria. So all the academics that write reams of books about the decline of the West have it completely wrong ! The West WON 400 years ago! Since which time the trend has been to assimilate the WHOLE WORLD into a Global Western Civilisation. The clash of civilisations is nothing more than propaganda, the reality is that the real enemy the west faces is not China or Islam but rather western politicians that are attempting to strip away what has made the west great, namely they wish to diminish capitalism in favour of socialism through the bailout of bankrupt banks and nations, when the lessons of countries going bankrupt such as Iceland show that it is infinity better to experience a couple of years of pain than die a slow lingering economic death like Japan. Therefore crisis are a good thing, we need crisis, we need recessions we need to clear the decks of all of the froth that has been built up and most importantly we need to inflate the debt away that will be soon forgotten during the next boom so the UK and US have it right, print money and inflate the debt away, the Euro-zone is collectively walking up to this reality. Stock Market Euro-zone Crisis Correction Over? For investors crisis present opportunities to accumulate at bargain basement prices with a view to protecting ones wealth in inflation mega-trend proof assets such as dividend paying stocks, commodities and housing. You buy when no one else is willing to buy and sell when everyone else is buying. We had our bust in 2008 into 2009 and are clearly still nowhere near the end of the recovery / boom cycle. My strategy all along has remained constant as iterated several times in articles and comments that I have viewed the series of panic lows as opportunities to accumulate more for the long-run in target stocks. Where the panic sell offs have cycled through sectors as most notably witnessed in the severe sell off in the metals and mining sector during the past few days. Well, that should be it, times up for the correction that was anticipated to end by about now, and I have seen little to change this expectation, after all there is now plenty of bearish sentiment out there courtesy of the perma-fools that tell people to SELL right at market bottoms which I am sure look set to contribute towards igniting a powerful stock rally for which there will be plenty of reasons published as to why stocks have rallied AFTER the market has risen. I will seek to map out a probable trend for the the next few months in my next article, ensure you remain subscribed to my always free newsletter to get this in your email in box. But look, its simple, they print the money, it floods into stocks and other assets. The money printing is perpetual i.e. for ever, as long as you value invest i.e. are leveraged to the effect of the money printing then you can't really go wrong! Unless you listen to the perma-fools, academics and the journalists, which unfortunately means approx 98% of the media your exposed to. Deflation ? Deflation is a delusion of delusional minds - as the earlier example illustrated. Your Inflation mega-trend investing wealth protecting analyst.